Stuff Huff match provided opportunity for Simpson and Sneed to see potential fellow Illini in action. Illinois' Jordyn Poulter (1) sets the ball during the game vs Louisville at Huff Hall on Friday, Aug. 28, 2015. Illinois won 3-0. As detailed in Daily Illini basketball columnist Alex Roux’s Monday story, 2016 basketball recruits Xavier Sneed and Xavier Simpson attended Friday night’s volleyball season opener. While it’s common practice for prospects of any sport to check out another program’s game or match while taking their official visits, Stuff Huff is easily one of the best events to showcase what being a member of the Illini community is all about. And it doesn’t hurt that the No. 8 volleyball team is downright nasty this year. The annual Stuff Huff festivities kicked off with a carnival — free food, moon bounce, etc. — at 5:30 p.m. Friday outside Huff Hall. That’s cool and all, but the real attraction was on the other side of Huff’s walls an hour and a half later, when head coach Kevin Hambly’s squad began its regular season against Louisville before 3,344 fans. In the student section, a wave of Illinois faithful rocked rhythmically back and forth like a giant orange sea. The crowd was littered with similarly colored headbands. One fan proudly raised a specially made, five-foot-tall Hambly fathead. Another donned a furry, striped costume complete with a rubber horse head mask. Higher up, families of former and future Illini nestled into every nook and cranny of bleacher space. And on the court, where it matters most, the Illini took care of business, sweeping the Cardinals in three nail-biting sets. Simpson, a 5-foot-11 point guard from Lima, Ohio, took in the action alongside his father and Illinois assistants Paris Parham and Dustin Ford. Meanwhile, Sneed, a 6-foot-6 wing from Florissant, Missouri, watched from the stands with junior forward Malcolm Hill, who’s expected to carry much of the load offensively during the 2015-16 season. Whether or not the X-Men know a lick about volleyball, what matters is they were exposed to a terrific sporting event and surrounded by thousands of Illinois die-hards. Amid news of former head football coach Tim Beckman’s firing and an ongoing lawsuit against women’s head basketball coach Matt Bollant (not to mention the school’s chancellor and provost stepping down), it’s dope that Simpson and Sneed could experience a school-sanctioned event executed to near-perfection. Stuff Huff was just a slice of Simpson and Sneed’s weekend-long visit, but I’m willing to bet seeing freshman setter Jordyn Poulter rack up 35 assists in an electric atmosphere had a positive effect on them. At the very least, we can be fairly certain the match didn’t reflect poorly on Illini athletics — which doesn’t sound like much — but has to be counted as a win with all the negative news surrounding Illinois programs lately. Friday night’s victory wasn’t a fluke, either. 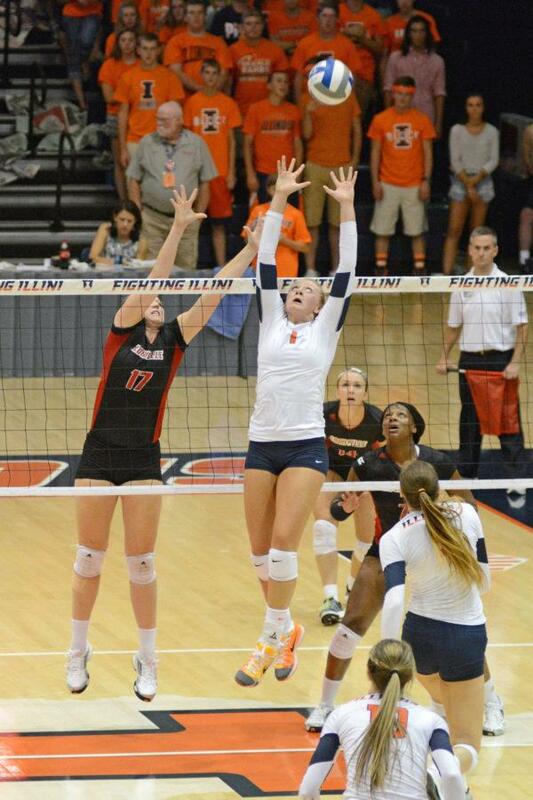 Illinois volleyball is now 32-10 all-time in season-openers, and the team is looking to compete for a national championship this year under Hambly’s tutelage. According to Roux’s Monday column, Simpson’s father Quincey said they have some future visits set up at other schools, but they may cancel them. Two things Quincey did make clear when speaking to Roux was that they are going to make a decision soon, and that they liked Illinois a lot. Now, the wait begins.